I am happy to let you know that over the last two weeks we have continued to make big strides in preparing our new facility for our Sunday services! After 7 years and 400 Sundays of setting up and tearing down in portable locations we have only 3 final Sundays remaining! That's amazing! You might have wondered why would a group of people invest so much time, energy and effort into a 'portable church' for 7 years? Everyone of us has a longing to connect with the transcendent and invest our finite lives into something larger than ourselves. We long for purpose, meaning and adventure. We long to be a part of a community of people where we won't be judged, where we can be accepted and grow into who were created to be. We long to connect with God in meaningful and life changing ways. We long to heal from the hurts of our past, to find shelter from the storms of life and find hope for our future. We long to find a place where our unique gifting can be developed into a superpower that helps push back the darkness and make this world a better place. We might not know it... but the place we are longing for is what Jesus called the Church. It's a community of miss-matched people from all walks of life, centered around Jesus, loving, learning and growing together and always welcoming others to join in the fun. It's what we strive for at Life Church. Its why we have given 400 Sundays of effort to setting up & tearing down. It's why we've sacrificed in order to buy this building. And its what we will focus on in our coming years as we settle into our very first permanent home. It's good to see that Wes Moyer takes Jesus' words to "Take up our cross" very seriously! 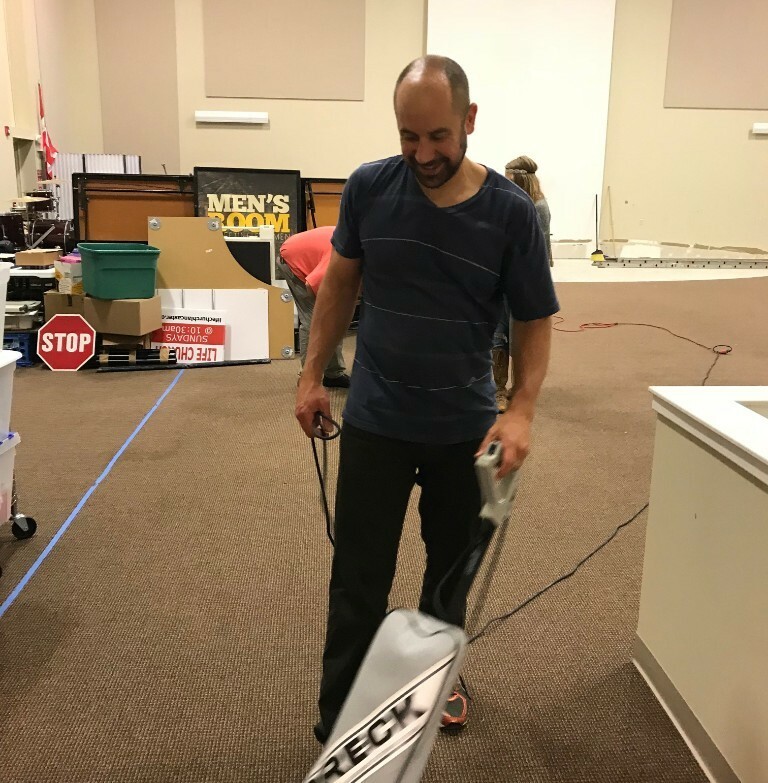 We are so thankful to have Staff Team member Brian Stricker making things happen! Brian has been juggling his day job, his family (with wife & 4 daughters!) and overseeing the construction project. He's doing an amazing job! Dena Maounis who is doing a killer job helping us sell unwanted items and finding amazing deals on new furniture, fixtures and decorations! Dena is also helping plan the interior design scheme for our new space! We accomplish a huge task last week when our work teams emptied the building of all our remaining unwanted items. We finally have some room to breath! Thanks John for your help! That vacuum cleaner looks good on you!